Hip Replacement Surgery | Should You Have Hip Replacement Surgery? Total Hip Replacement (THR) is a treatment to all kinds of hip arthritis, improving the quality of life of patients who undergo the operation. 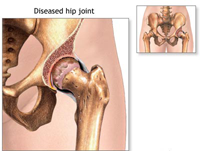 The trouble causing hip is surgically removed and replaced with an artificial one. In Total Hip Replacement, the entire femoral head is removed. A new ball and socket is placed as an implant/prosthesis. The new hip ball is attached to a stem which gets machined inside the hip bone. Hip Replacement Implant can wear out over a period of time due to various reasons. The average hip replacement traditionally lasts for 15-20 years, but in younger patients it can wear out much sooner. 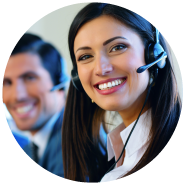 Once the hip replacement implant wears out, a revision hip replacement procedure may be considered.There are two major types of artificial hip replacements – Cemented Prosthesis and the Uncemented Prosthesis. Both types of prosthesis are widely used. 1) The acetabular component, or socket portion, which replaces the acetabulum. 2) The femoral component or stem portion, which replaces the femoral head. Rheumatoid arthritis: This condition causes inflammation of the synovial membrane, which produces the lubricating fluid for the hip joint. 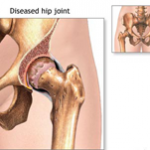 Arthritis caused by hip fracture/trauma: Fracture of the hip or severe damage to the ligaments in the hip joint can cause degeneration of the cartilage, resulting in hip pain. Big Savings! Getting a Hip Replacement or a Hip Resurfacing Surgery has become a very expensive affair in USA or UK. For example, a Hip Replacement/ Resurfacing Surgery in USA would cost you 33,000 to 57,000 US Dollars whereas the same surgery would cost you just one fifth or one sixth of that cost in India. Many patients suffering from severe Hip Pain are postponing there surgery due to high cost of surgery. Most of these people are either uninsured or underinsured. They lead a very painful life till they are able to arrange money for an expensive surgery.